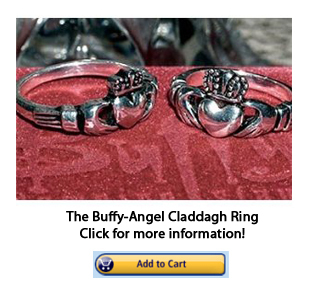 On Buffy’s seventeenth birthday, her boyfriend Angel — a vampire originally from Ireland cursed with a soul that tormented him into doing works of good that would benefit both people and the world — gave this ring to her as a present. Still today, the ring has remained a significant token to fans both of the cult television-program and Irish lore in general. Now, the ring is available here. Of course, those who know “Buffy the Vampire Slayer” know how the story unfolded. Shortly after Angel non-verbally told Buffy of his devotion to her and gave her what would become known as the “Buffy ring (Claddagh ring),” Spike and Drusilla found and reassembled The Judge, a demon who had been viewed as indestructible and had been cut into parts to protect the world him him. Buffy and Angel were almost killed by The Judge, but they narrowly escaped. Later, while hiding out at Angel’s lair, their emotions finally overcome them, and Buffy and Angel sleep together. (Buffy, as we know, was a virgin at the time.) Unfortunately, Angel’s curse was that he would lose his soul if he would ever have a moment of true happiness, and sleeping with Buffy was exactly that. Angel reverted to the evil vampire Angelus, and that change set into motion the rest of Season 2. Eventually, Buffy removes the ring and keeps it on her bedroom table. Early in Season 3, when she is dating Scott, she starts to get over Angel after the traumatic events of Season 2, so she returns to Angel’s old lair and leaves the “Buffy ring” on the floor. What happens next is something that no one could have foreseen at the time.